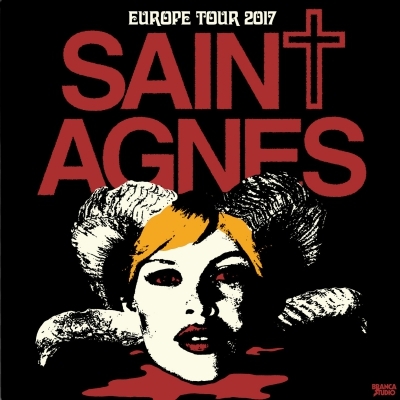 Young London-based band SAINT AGNES has issued a 5-track promotional release to accompany their European Tour 2017. SAINT AGNES don’t even have a complete record yet – but we sure wish they did. The band’s music is chill, but full of attitude. Their hipster-rock look translates well into their music, which contains vintage sounds, catchy riffs and precise drums. The cherry on top of the SAINT AGNES sundae is certainly singing duo Kitty Arabella Austen and Jon Tufnell, whose voices complement the band’s bluesy rock very well. The vintage touches of instruments like tambourine, harmonica and electric church organ make the selection of SAINT AGNES-songs fun to listen to and will make my softer, more mainstream playlists – and I am always on the look for “less heavy” music to listen to when hanging out with non-metalheads. And I’m going to be listenting to ‘Merry Mother Of God Go Round’ for the next few days. SAINT AGNES‘ tour through Europe is almost over and there are only a few dates left in the UK, but we’ll keep an eye on the newcomers. What do you think about SAINT AGNES? Scroll down and leave us a comment!